We've loved the iPad and iPad users have loved our app from the start. The iPad is such a great device for a travel guide. It may not be the device that you carry around when you hit the streets, but it's close to perfect for reading in the airplane or getting some inspiration in your hotel. So when we were redesigning the iPad app it was this behaviour we had in mind. You use the iPad to get inspired about the place you are visiting, but also to read about the history or the architecture, and you bookmark all your personal discoveries. These are synced to your phone so when you visit the town you won't have trouble finding then. The bookmarking functionality has been very popular from day one - and with the way the new iPad works we expect it to become even more popular from now on. But if you are somewhere deep in our guides it took quite a few taps to go back to the bookmark page. So we changed that. From now on, they are just one tap away. Tap left bottom corner and you will see all your bookmarks. We know how important it is to keep track of what you do when you travel. So far the only thing you could do in our app was keep track of the places you visited. It's a great feature and it's a hassle free way to create a great looking travel log even when you are offline, but we think we can do better. So what we did is make it easier. 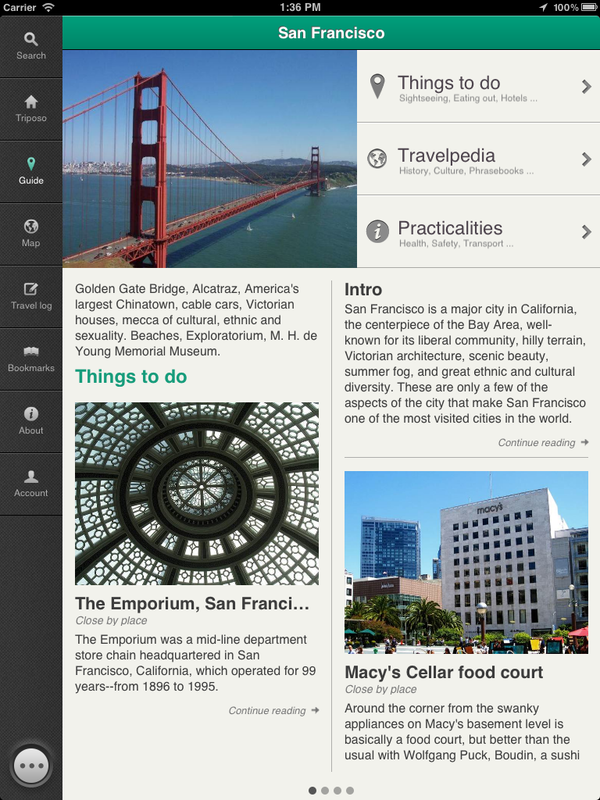 We made it easier to add the pictures you take to your travel log directly from the first screen of the app. We made it easier to do checkins, we made it easier to add little notes. And we made it easier to edit what you added before. Finally, we made it much easier to see your complete travel log. Both on iPad and iPhone it's now its own mini-app within the Triposo app and everything you want to do, you can do it right there. Been using it with an iPad - awesome. Very useful. There is indeed a bug on iOS 6 with rotation. We've fixed it and have uploaded a new version and we're waiting for Apple to approve it. You can develop all these idea through more creative way. Have you heard about inventive writing tips? There are some different types of writing technique such as style, design, and format. If you include all these styles you can make your blog more attractively. For that you can go through best thesis writing service . you desire much more specifically if you pay attention to Pandora primarily official site The arbitrary song play belongs to Pandora's licensing contracts. Whatever you need to find out about Hotschedules, consisting of a thorough login. official website For staff members, the system allows them to conveniently view their changes. You can develop all these idea through more creative way. Have you heard about inventive writing tips? There are some different types of writing technique such as style, design, and format. It looks really cool, Thank you so much for sharing these amazing tips. Your information always help me.